Bird's nest ferns are actually one of two asplenium species found in cultivation. The other, often called the spleenwort or mother fern (A. bulbiferum) is much harder to grow and looks nothing like its cousin. These ferns are naturally epiphytic, and in their rainforest homes, can be found growing high in the crooks of trees. They grow in a series of erect, spoon-shaped and apple-colored fronds that rise from a central rosette. Healthy plants can have fronds up to three feet, but this is rare in most indoor situations. These are beautiful plants, but will require a bit of babying to reach their fullest potential. Light: Filtered light to light shade. Don't expose to direct sun, other than very early morning sun. Water: These are true jungle plants—keep their compost moist and provide the highest humidity possible. Temperature: They will begin to suffer below about 55ºF for prolonged periods. Best kept between 70ºF and 80ºF, with high humidity. A warming pad will often help dormant plants. Soil: Loose, rich organic compost. Fertilizer: During growing season, fertilizer weekly or biweekly with weak liquid fertilizer. Don't put fertilizer pellets in the central cup. These are not easy to propagate and cannot be divided, as with some other fern species. They are usually raised from spore or tissue culture, meaning propagation is usually beyond the reach of most home growers. Bird's nest ferns prefer to be slightly underpotted. As naturally epiphytic plants, they are used to growing in a minimum of organic material, and mature plants will elongate above the soil level as the fern grows and sheds lower leaves. The problem, of course, is that large ferns will easily tip over their smaller pots. When repotting every other year, use the next pot size up and refresh the compost. 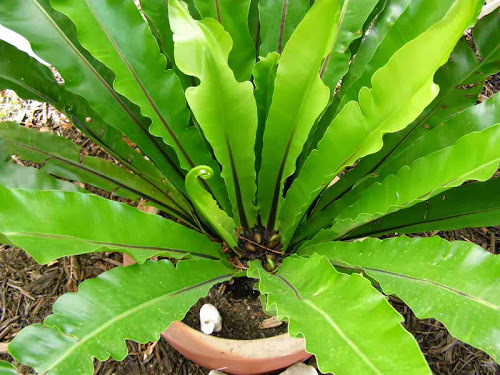 The basic bird's nest fern is Asplenium nidus. Another Asplenium species (A. bulbiferum) is sometimes available, but this is a much more difficult fern to grow indoors. Some varietals of A. nidus have been developed, usually with crinkled or frilly leaf margins. Bird's nest ferns are beautiful, and many conservatories and greenhouses boast impressively large specimens. They are a natural with orchids, bromeliads and other rainforest plants. The key to a healthy bird's nest fern is providing enough warmth and moisture. Given these two conditions, the ferns can withstand higher light levels. A shower ledge by a window is a good place for a healthy bird's nest fern.